Been the dominant non-linear editing system in film and television industry early 1990s, it was once reported that no editing software can compete with Media Composer so a lot of people love to edit video with Avid Media Composer for its excellent and professional editing functions. It allows users to edit film including uncompressed standard definition (SD) video, high definition (HD), 2K and 4K. The supported video formats are pretty wide and given below is a form of supported video formats of Media Composer. From the form above, we know that MP4 is supported by Media Composer. However, some users reported that they can't import MP4 into Media Composer. The reason is that Media Composer only supports MP4 with MPEG-2 codec and you can't import MP4 with the codec H.265, H.264, VP8, DivX, etc. What should we do if our MP4 video is not encoded with MPEG-2? We recommend that you'd better to convert the MP4 file to Media Composer supported formats through software. Faasoft Video Converter (for Mac, for Windows) is such a program that allows you to convert any MP4 video to MP4 with MPEG-2 codec. Except MP4, this MP4 to Media Composer Converter can also support users converting a lot of video files like ASF, WTV, 3GP, OGV, AVI, WMV, FLV, MKV, MOV and more. 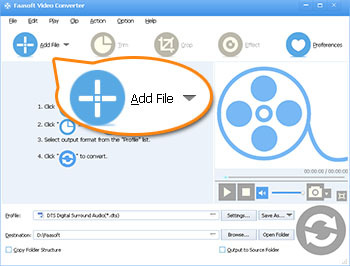 The following is the full guide on how to convert MP4 to Media Composer using Faasoft Video Converter. Besides Media Composer, it helps many people out of trouble like can't import FLAC into iTunes, QuickTime won't support MP4, can't import AVI into Sony Vegas, Windows Media Player won't play MOV, etc. Yes, it's pretty powerful. After downloading and installing Faasoft Video Converter on your computer, run the application from your desktop. The efficient way to import file to Faasoft software is dragging and dropping. The application will read the file and display it as a thumbnail in the task list immediately. The imported files can be more than 150 kinds. Click the drop-down button beside "Profile" to open the output format list and there choose the output format for Media Composer, for example, select "MOV QuickTime Video (*.mov)" that Media Composer supports from "General Video" category. Before start the conversion, click "Effects" button and switch to "Video Edit" window. Crop video, add effects, adjust image brightness, etc there. Move your mouse to the big "Convert" button on the bottom and the program is activated to process the conversion from MP4 to Media Composer and the conversion will be finished in just a few seconds. Switch to "Open Folder" tab and the converted MP4 file is ready to be used.